NVIDIA (NVDA) is set to report Q4 results tonight after the close with a conference call to follow at 5pm ET. NVDA is expected to report results at 4:20pm ET.Current Capital IQ consensus stands at EPS of $0.98 on Revenue of $2.10 bln. 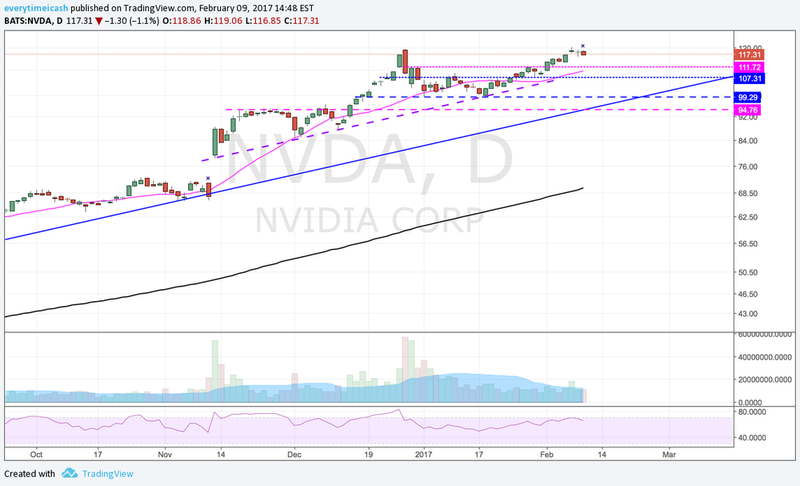 NVDA has posted six straight beat and raise quarters. Its Q3 results saw revenues increase 54% y/y and Non-GAAP EPS run 104% as a better product mix allowed for margin expansion at the company. The company faces hefty expectations ahead of its Q4 print. Q1 guidance will be pivotal for them. Revenue of $2.1 bln +/- 2% (~2.05-2.15 bln which would be an approx 48-52% y/y rev growth); Q3 revenue growth was 54%. Non-GAAP Gross Margins 58.7-59.7%; Street Expectations approx 59.2%. Non-GAAP Operating Expenses ~$500 mln. NVDA holds ~70% of the market vs 30% for AMD. Reports Q3 (Oct) earnings of $0.94 per share, excluding non-recurring items, $0.26 better than the Capital IQ Consensus of $0.68; revenues rose 53.6% year/year to $2 bln vs the $1.69 bln Capital IQ Consensus. Expectations are really high for this one but the trend has been sensational this last year. Tough to call a top here.